Who is O. P. Riegel, you ask? 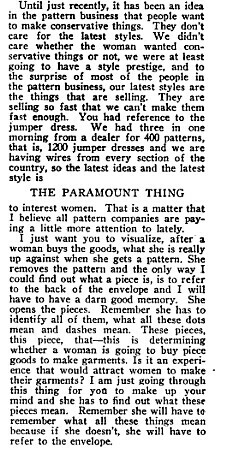 He was, in 1921, an executive of the McCall Pattern Company, and he gave an address that was covered by America’s Textile Reporter, which is probably now my new favorite magazine. Here’s part of his address to the Mid-Year meeting of Jobber’s Association of Dress Fabric Buyers (oh that is straight out of an O. Henry story! ), held at the Waldorf Astoria; you can read the whole thing here. This seems to cover the birth of the printed pattern. So cool. Way cool. Also cool is William Sydney Porter. He could certainly fling the words about. “Jobber’s Association of Dress Fabric Buyers” should be resurrected, as an honorary on-line fraternal organization for sewing bloggers, if for no other reason. I really want the Kent State Fashion Museum to do an exhibit around the history of the printed pattern. I’ve suggested it, but no dice. Ann, shouldn’t we request an exhibition rather than (one measly) exhibit? Jobber’s Association of Dress Fabric Buyers: I’m trying to imagine what thier uniforms must look like. I’m pretty sure it involved hats with little veils, gloves and fine wool gabardine. AHA! very interesting. I am in process of using an old Vogue pattern that has not printing, etc. & was wondering when they added the print. Good on you!